In the early 1950s most publications ignored the anti-colonial campaigns in progress around the world and focused almost exclusively on the East-West “superpower” struggle between the USA and the USSR. But not Toward Freedom, which debuted at the end of 1952 as a modest three-page newsletter. Defying conventional wisdom, it took on two daunting tasks – correcting distorted perceptions of world affairs and working for the peaceful elimination of colonialism. The name was based on the title of a book by Jawaharlal Nehru, the Indian leader who was inspiring what became known as the non-aligned movement. 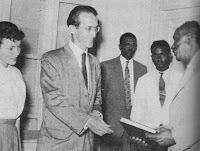 Nehru had also inspired William B. Lloyd Jr, who met him during a visit to India. After a private conversation he said that Nehru’s “grasp of world history and clear leadership on behalf of the dispossessed was enormously impressive. Over the next three decades Lloyd followed independence movements, UN initiatives and contributions to world peace made by what were then called “third world” countries. His early collaborators included American Friends Service Committee organizer Robert Pickus, Unitarian minister Homer Jack, author Sid Lens, Roosevelt University President Edward Sparling, union activist Harold Snell, and Chicago area friends like Leon Despres and Ethel and Frank Untermeyer. 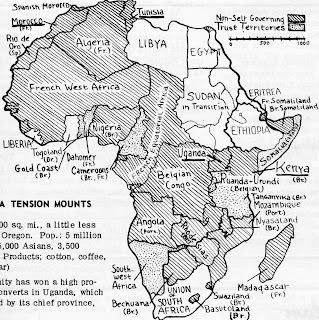 The first issue appeared on December 6, 1952, and included reports of Britain’s response to the Mau Mau rebellion in Kenya, a defiance campaign against apartheid in South Africa, and an attempt by Asian and Arab nations to get the UN engaged in mediation between France and its African territories. Lloyd took note of recent UN actions on colonial issues, pointing out that the world body often voted with the colonial powers on questions like conflict resolution and independence. He also announced the formation of a Midwest Committee for Colonial Freedom, and plans for a series of classes on Africa at Roosevelt College to be offered by members of TF’s evolving core group. 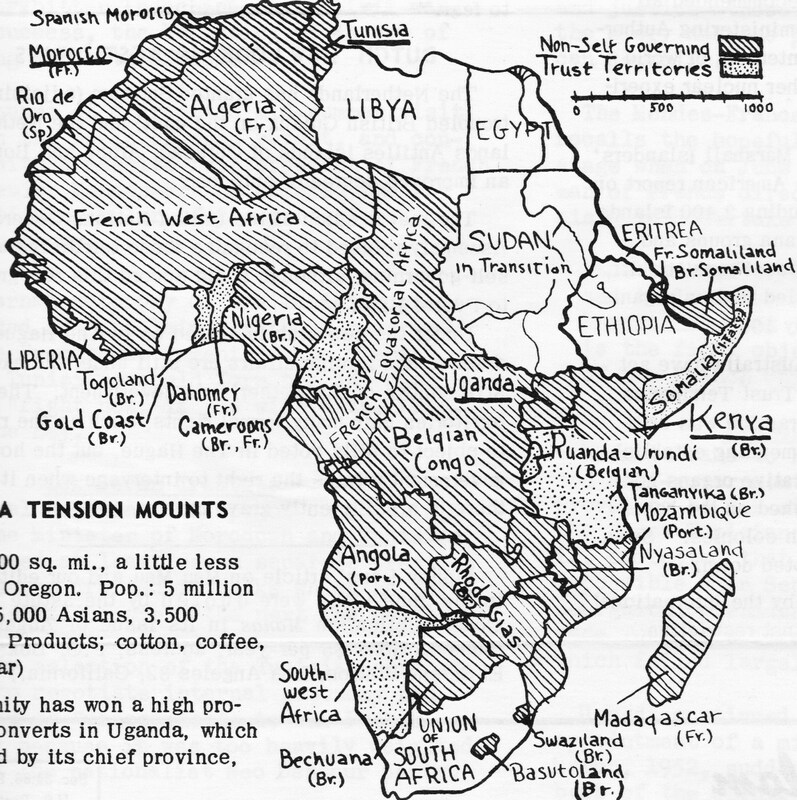 In Volume 2, Number 1, published in June, 1953 the editor asked a pointed question on the front page: Where does America Stand on Africa? Sixty years later do we know yet? Four and a half years later Bill met with the country’s president at his home. He also proposed that Article 73 of the UN Charter be used to guarantee liberty. His argument was that the Charter obligated colonial powers to publicly report on their territories. But he noted that they “have promoted the fear that the General Assembly might prevent statehood for Hawaii or Alaska.” In January Washington had followed suit by announcing, unilaterally, that no more information would be officially transmitted to the UN on Puerto Rico. TF provided context that exposed the real conditions and what these “territories” really were – colonies, former colonies, unrepresented nations, peoples and indigenous communities around the world, struggling and sometimes succeeding in claiming their names, land and rights. Four years later he also met Nkrumah. But when he asked about Ghana’s Interior Minister threatening political opponents with concentration camps the Prime Minister excused it as a trivial local scare tactic. A warning sign, to be sure. The December issue was mainly devoted to an election in The Sudan, UN votes on “colonial changes” in Puerto Rico, Surinam and Netherlands Antilles, and an early essay by Rev. Homer Jack, who wrote about how protestants saw colonialism. Jack soon became a second major voice of the publication. In October 1954 TF covered negotiations between mining companies and employees in Northern Rhodesia, including statements from two unions that called out the companies for discrimination based on color and social background. On the Road Toward Freedom: A Cold War Story, part one of six.